We collect your email address in order to: Provide services at your request. The Focus Website is provided “as is.” We do not claim that it will be without errors or interruption free. There may be errors in information provided to us by outside parties. Events may be cancelled without notice. We may receive incorrect dates and/or contact information. We do reserve the right to make any corrections, but assume no duty, to any errors or omissions. We are not responsible in any way for third-party products or services that may be linked to this site or that you may obtain from third-parties. We disclaim any express or implied warranties, including without limitation, any information or goods available, sold or advertised on this site. By use of the Focus Website you agree that we are not liable for any damages or harm attributable to any feature or product on the Focus App and agree that you are using it solely at your own risk. 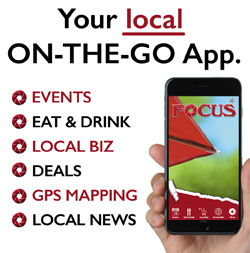 Focus App, its parent and affiliates, and their directors, officers, managers, employees, shareholders, agents and licensors are not liable for incidental, indirect, consequential, special, punitive, or exemplary damages of any kind, including lost revenues or profits, loss of business or loss of data, in any way related to the Focus Website for any claim, loss or injury based on errors, omissions, interruptions or other inaccuracies on the Focus Website, including without limitation any warranty or term of agreement between Focus Website and you and/or your business. Any claim against us shall be limited to the amount you paid, if any, for use of the Focus Website. All rights reserved. This material may not be published, broadcast, rewritten or redistributed, with the exception of sharing information from and about the Focus Website on social media. Also, these files may not be used to construct any kind of database. © 1978 – Present, Tucker Productions, Inc.